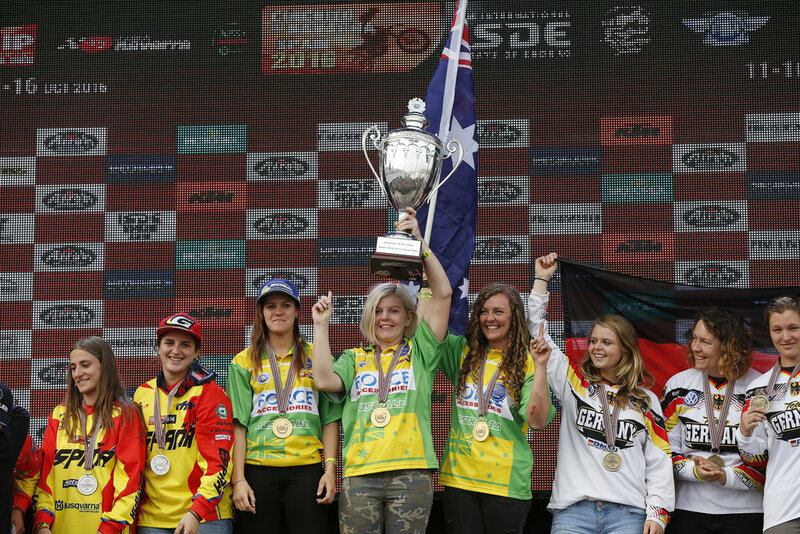 The Australian ladies' team celebrated victory for the fourth successive year in the 2016 edition of the FIM International Six Days Enduro (ISDE) Women's Trophy held in Navarra, Spain. Jessica Gardiner (Yamaha), Tayla Jones (Yamaha) and Jemma Wilson (Yamaha) more than lived up to their reputation as favourites, leading from the opening day and then signing off from the competition with each of their three riders safely reaching the end of their motocross races on day six. The Australians didn't have it all their own way though, with Laia Sanz (KTM) leading a Spanish challenge that kept the pressure up in the early stages. Sanz, the recently-crowned five-time FIM Women’s Enduro World Cup winner, produced some impressive personal displays, including the overall fastest time on day four, whilst Maria Franke (KTM), the fastest rider on day two, also played a starring role as Germany mounted a challenge for the podium. However, nobody was able to match the speed, concentration and consistency of the Australians, who claimed a fourth class win in as many years. Host nation Spain held on to the runner-up result with Germany third.